Material Impact Fund co-founders Carmichael Roberts (left) and Adam Sharkawy at their office in Boston. When Carmichael Roberts first arrived in Boston as a 25-year-old chemist who had just earned a doctorate at Duke, he didn’t know what a venture capitalist was. It was the mid-1990s, and Roberts had landed a fellowship at one of Harvard’s highest-profile labs. But more than two decades later, Roberts has become one of the most respected venture capitalists in Boston, and he has been setting up his own venture capital firm, the Material Impact Fund. It’s on track to announce this summer that it has collected about $100 million to put into new startup businesses. 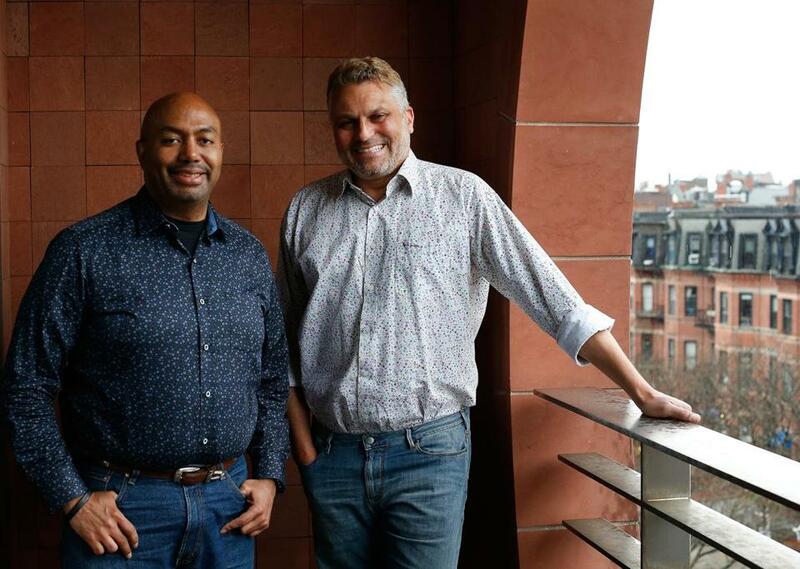 Roberts is also the only African-American venture capital “partner” — that’s the industry term for a decision maker, rather than someone who analyzes potential investments — that I’ve met in my 20 years of covering the startup scene in Boston. He grew up in a public housing complex in the East New York section of Brooklyn — “one of the roughest parts of New York,” he says. His parents worked administrative jobs on Wall Street, and by the time Roberts was in fourth grade, they’d engineered a way to move the family out to Long Island. He became an honors student, a linebacker on the football team, and a member of the concert choir. Roberts loved learning about biology, and envisioned becoming a doctor. He was accepted into Duke, and stuck around for a PhD in chemistry. One of the members of his thesis committee directed him to the Whitesides Research Group at Harvard. “The experience at Harvard was magical,” he says. Whitesides “was advising General Motors, the Joint Chiefs of Staff, and starting companies.” Roberts went to work for one of those spin-out companies, GelTex Pharmaceuticals, for a short time, but took a leave to earn his MBA from MIT’s Sloan School of Management. He helped start several companies out of Harvard that sought to develop new drugs and new ways to deliver drugs more effectively in the body, raising tens of millions of dollars to get them up and running. He joined a venture capital firm, North Bridge Venture Partners, in 2007, and helped Whitesides spawn another startup, MC10. That company developed a way to print circuitry onto flexible and stretchable materials, rather than stiff resin boards. One of MC10’s highest profile projects was a $150 skull cap that can be worn under a football or hockey helmet; it was designed to alert coaches when a player received a serious blow. But many of the companies that Roberts has helped launch thus far in his career are the kind that can take a decade or more to get a product to market — and sometimes fail before it gets there. Asked about his biggest hit so far, he mentions GelTex, which was acquired by Genzyme in 2000 for $1 billion. But Roberts was only a “manager or a low-level executive there” for about six months, he acknowledges. Material Impact, which Roberts runs alongside former medical device exec Adam Sharkawy, has so far put money into three companies. One, an Arizona startup called Zero Mass Water, is developing an off-grid system that uses solar power to extract drinking water from the air. It was founded by an engineering professor at Arizona State, Cody Friesen, who invited Roberts to stop by on a trip from California back to Boston. Another firm Material Impact invested in is Soft Robotics, a Cambridge startup designing a more capable hand for robots. Its CEO, Carl Vause, says that many robotics companies have sought to “build the Terminator hand, with lots of joints and motors and sensors.” Soft Robotics is building something more like a blob-like “octopus hand,” he explains, able to deform and then surround an object to pick it up. “I hope I’m a role model, that I can convince more people that they can do it,” Roberts says. Not likely, but good luck trying.